It's inevitable. At some point, your business will experience data loss. It could be a simple PC meltdown, a hard-drive crash, or something much worse. If you neglect to protect your mission-critical applications and data, even the smallest of disasters can have a devastating impact on your business. How much money does your business stand to lose for every hour or day your workers sit idle, unable to deliver products or services to customers? According to a recent study, the average loss per hour is $12,500. 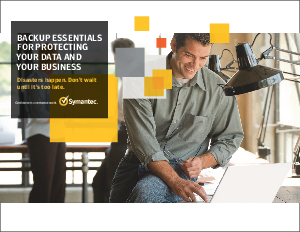 rather than finding out through bitter experience what your loss will be, now is the time to put in a place a backup plan and solution that will keep your data and applications safe and ready to restore whenever needed. To help you with your backup plan, this e-book gives you key guiding principles for effective and efficient disaster recovery, insights on how to ensure your backup solution meets your organization's unique needs, and what steps you should take ahead of time to minimize business disruptions when disasters occur.